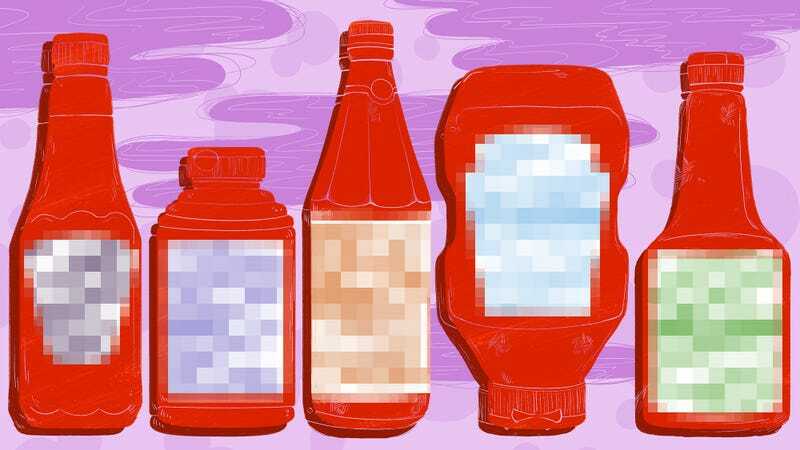 Why are we trying to improve upon ketchup? Why do we keep chiseling away when the condiment-equivalent of Michelangelo’s David exists? The perfect ketchup has been created, we postulated not too long ago, and it was Heinz. Retire the trophy. Or... is it? The more I stewed on this, the more skepticism crept in. As much as we’d like to think we’re free-thinkers, impervious to marketing and its influence, the stuff kinda works. We say we taste with our tongues, but really we taste with our minds, and some of what we taste is brand familiarity. One thing we can state as fact is that Heinz is the market leader for ketchup. But is it really the best-tasting ketchup? The fairest way to administer our experiment is a blind taste test. I went to several supermarkets and picked up eight bottles of ketchup with national distribution (which means the artisan small-batch catsups were out of the running). Then I squeezed out the ketchups onto numbered plates, and tasted each one using French fries. I also employed a dozen colleagues at Takeout headquarters to take part in this taste test. The biggest problem I anticipated was that all our samples will taste about the same. None would likely taste bad, none would likely blow our minds. This was ketchup, after all. The variance would be minute, and it was bound that any single bottle could be someone’s best as well as someone else’s worst. And so we tasted, and tasted, and tasted some more. Here’s what we discovered. Top row left to right: Hellman’s, Whole Foods 365 Organic, Heinz, Annie’s Organic. Bottom row left to right: French’s, Hunt’s, Sir Kensington, Heinz Organic. Nearly everyone identified which two belonged to Heinz (no. 3 and 8 in above picture). It was uncanny. One person said they immediately associated its sweet flavor with McDonald’s fries. It also has the smoothest, most velvety consistency, with an acrylic paint-like gloss. No one, though, could discern any difference in taste between Heinz’s conventional and organic variety. We all tried really hard, and not one person could tell one from the other. I suppose with organic you’re paying for the feel-good sentiments. Sir Kensington was the most polarizing ketchup. One person said it tasted too far from the Heinz-ideal of ketchup. “This reminds me of salsa,” another person said. Others (myself included) liked it for the exact reasons others didn’t—there was a Bloody Mary quality to it, the texture was more pureed than pulverized-smooth, with a black peppery taste that lingered. If you enjoy ketchup on the high end of sweetness, Hellman’s and French’s are for you. Hellman’s (“They make ketchup? !” was the most frequent comment) used honey and the taste poked through. French’s was just flat-out sweet—some described it as candy-like. The most disappointing of the ketchups sampled was Hunt’s. The dominant flavor most picked up was vinegar. Others invoked “pretty dull” and “muted” in their descriptions. However, this illustrated one of the problems with this type of experiment: When’s the last time we tasted more than two different ketchups side-by-side, let alone eight, then forced to make critical judgment? It’s like buying a TV at Best Buy. Stack a dozen flat-screens next to each other and you can detect differences. A feature not quite your liking would automatically get disqualified. But once that TV is hung in your living room—it’s perfectly fine. I’d like to think this applies to ketchup. I’m sure if all I had was tater tots and a bottle of Hunt’s, it’ll do the job. A lot of people enjoyed Whole Foods 365 Organic ketchup. More than one person said it had the sweetness of fire-roasted tomatoes. Topping Whole Foods by several votes: Annie’s Organic. In our blind taste test, more people liked this than any other. The interesting thing is everyone detected something different: Some said it was sweetness, others a subtle tang, several picked up on cinnamon (it was actually cloves and allspice), and yet others liked that savory umami backend. I tasted this a half dozen times, and it was all those things. It also had a thicker, grainier texture than others (though not quite Sir Kensington’s), and there was a noticeable spicy kick. It managed to taste like familiar ketchup, but with just enough to make the flavors unconventional and interesting. The recurring theme is “balance” and they’ve got that down pat. Well. Without labels or marketing, Heinz did not come out on top. If anything, people identified the Heinz flavor and that influenced the decision. But when we relied on just our palates, a different winner emerged.